CRAPTASTIC: Party All Week Long! Have all of you heard of The DIY Club?! If not, you should definately stop by and check them out! They are celebrating their one year anniversary with FOUR parties and tons of giveaways! Their celebration is running from April 16 - April 30. In addition to all the parties, they will be doing giveaways and project features! Its So Very Cheri will be hosting the delightfully decopaged party! 504 Main is in charge of the all white decor party! Link up anything that is white; food, decor, furniture! 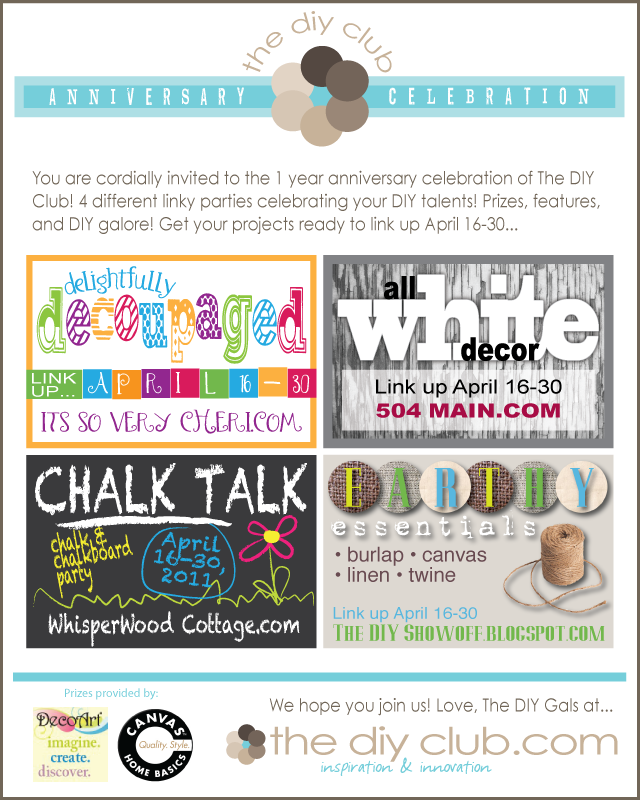 Lastly, The DIY Showoff is in charge of the earthly essentials party! So I hope you all get a chance to go check it out! I'm on my way to link up now! I'll be back tonight with some sweet little chairs I refinished for my neice and nephew!